“Since early Sunday morning our monitors on the ground have been recording an extraordinary number of ceasefire violations since the very morning on Sunday. This number increased from hundreds of ceasefire violations to thousands on a daily basis. On Tuesday (January 31) we actually recorded 11 thousand. 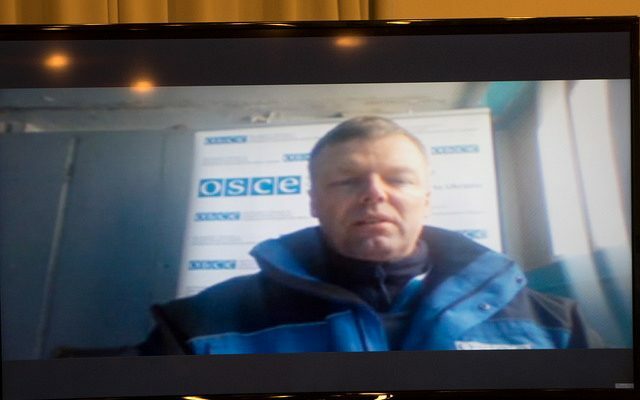 This is truly unprecedented,” said Alexander Hug, First Deputy Chief Monitor of the OSCE Special Monitoring Mission to Ukraine via Skype from Donetsk filtering station at a press briefing at Ukraine Crisis Media Center. SMM recorded frequent use of multiple rocket launcher systems (MRLS) within this triangle. “On Tuesday we recorded MLRS impacts in Avdiivka, and outgoing MLRS rounds in Yasynuvata and Horlivka (territories that the Ukrainian government does not control – UCMC). On Wednesday we saw an MLRS impact site in Yasynuvata, and heard MLRS impacts in Kruta Balka and more outgoing MLRS in Horlivka,” said Hug. OSCE observers also registered MLRS impact in Sartana near Mariupol. The mission also recorded numerous destructions in residential areas as a result of shooting attacks on both sides of the conflict. According to Hug, SMM teams on the ground in Avdiivka and Donetsk are verifying information on civilian casualties resulting from night shooting attacks at both towns. Hug warned about possible scenarios of humanitarian and environmental disasters as a result of combat near Avdiivka. “Already we have seen the people of Avdiivka being cut off from electricity, heating and water as the nearby water filtration plant in Yasynuvata has had problems operating,” informed the Deputy Chief Monitor. “Worse can happen if the chlorine tanks at the plant are hit,” he added. The ceasefire held in Yasynuvata yesterday. It was agreed upon to give repair teams a chance to renew vital infrastructure.